Countdown to a catastrophic mega-quake in the U.S. This entry was posted in Earth Changes, Earth Watch, Earthquake Omens?, High-risk potential hazard zone, Lithosphere collapse & fisssure, Potential Earthchange hotspot, Seismic tremors, Signs of Magnetic Field weakening, Strange unexplained noises, Time - Event Acceleration, Volcano Watch. Bookmark the permalink. thanks…i was hoping you would cover the VERY telling EQ patterns that are happening right on the san andreas right now and for days…starts smaller in so cal and gets larger and moves up towards eureka. it’s been cycling like that for days, as i said. they are getting slightly bigger as well. I’m curious about a dream that I had once where a hand came out of oval shaped clearing in the clouds and picked what looked like a stick that you see used as a stake for tomatoes. The only area that is resonat to the shape and colors which seem to be what I believe is considered the locked area (ref. USGS California map there is an area which is yellow in the same shape as in my dream adjacent Taft and below Parkfield) close enough for me I guess. The video points out that this event would be bad but the US can rebuild itself. Yet they don’t say what the individual can do to help avoid making the situation worse, or what would happen if there were more events going on nation wide. Compounding events can tax nations resources and make it much worse for all. This report doesn’t surprise me. As they say, It’s not a matter of it, but when. On another note, the tremors travelling from west to east is continuing. There was a 2.7 in Illinois. Not much on it’s own, but the pattern has drawn my attention. This is all well and good and I do believe the BIG ONE is coming, but who is watching all the quakes in east TN, east KY, and West Virginia? They are giving California a run of the most daily quakes.Your thoughts? William, I’m glad someone else is noticing this. 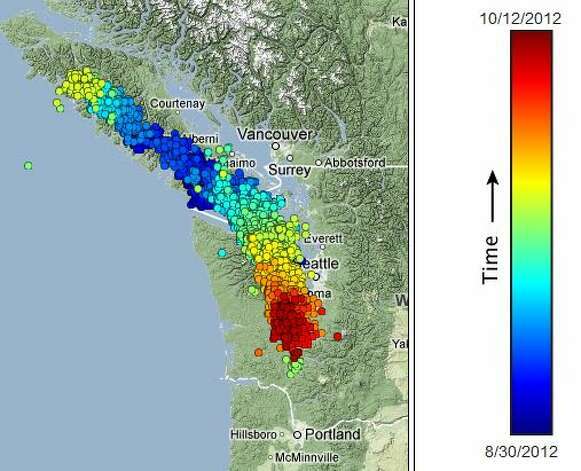 the quakes are moving west to east. It’s becoming unnerving, like something is coming our way. Everyone looks towards the West coast, as they should, but so many ignore the Midwest and the East coast. Sometimes (and this only my amateur observation/feeling) I think that when the focus of attention is directed to one area predominantly, another can come up as the surprise event in a different area. The east needs to be observed quietly, along with the happenings in the west. There seems to be a ‘line’ (of sorts) which one can mentally draw from the east coast, through the lower states of the U.S., through to the west coast (and up, obviously, to the border with Canada – even up into the Gulf of Alaska). I tend to feel that there is a geological/faults ‘relationship’ associating all of these states (generally speaking). The Earth is definitely ‘talking’ in many areas on the planet, but I feel it is worth observing and keeping in mind the activity in the eastern states. The earthquake in Illinois scares me. When they start to pop up in new states and close to the New Madrid faultline it’s scary because its so new. Maybe no place will be safe if this continues. Lets hope not. Love your site. Been a follower for a few years now. All the information is somewhat calming. Better to know then be blind. Thank you Alvin. I have been analyzing the timeline of Cascadia quakes of magnitude 8+ and 9+ over the last 6000 years. I have made graphs of the average time remaining to the next one (y years), given that x number of years have passed since the previous one. What I am finding is that, if you only look at 9+ quakes, the time since the last one doesn’t seem to matter much. But if you look at time since the last 8+ quake, the average time remaining to the next 8+ and the next 9+ can be quite short. It has been 313 years since the last 8+, which was also a 9+. My graphs suggest roughly a 50% chance of a 9+ in the next 50 years. I’m sure professional geologists are capable of doing a better analysis than I can, but I’m not sure they are sharing their most worrisome forecasts with the public. I live one mile from the Washington coast, near Westport, so I have taken some precautions. My back yard is about 40 feet above mean sea level, the same height as the official gathering point a block away. I keep emergency supplies on top of the hill, and I have an extension ladder already tied to a tall tree as a last resort. I expect to be on my own out here in the boonies for up to a month; rescuers will be overwhelmed in the cities, where most of the casualties will be located. My tree may not be high enough to save me, but there will be no possibility of reaching any better refuge when the time comes. Roads and bridges will be impassible, and there are no public vertical evacuation shelters along this part of the coast. No structure on this part of the coast can withstand a large tsunami. There is one small area near the coast which is 60 feet above sea level, and that may not be high enough. Much of the commercial and industrial areas, here, already flood when large waves coincide with a high tide. After the great quake, the land will be about 6 feet lower. Having lost perhaps 95% of the tax base, cities like Westport will be abandoned for many decades. That was during the Maunder Minimum, 1645 to 1715. We are now entering a new minimum, the Landscheidt Minimum, which was predicted by Theodor Landscheidt back in the 1980s. It is known that quakes and volcanic activity increase during periods of solar minima. If Landscheidt is correct when he suggested that this minimum could turn out to be as deep or deeper than the Maunder Minimum then the USA may see some quake action, we are already seeing a ramping up of volcanic activity elsewhere in the World.